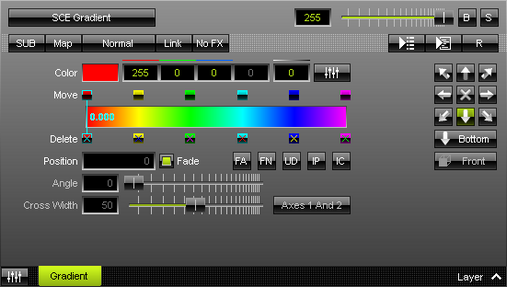 SCE Gradient is all about creating various color gradients. ▪ Color - Defines the color via a Color Gradient and various options. ▪ Angle - Allows you to change the angle in which the effect is displayed [in °]. Is only available for Mode Radial. The default value is 0. Valid values range from 0 to 359. Cross Mode Axes - Is only available for Cross Mode. Allows you to choose to which axis Cross Mode applies [Axes 1 And 2, Axis 1, or Axis 2]. The default mode is Axes 1 And 2.